Expansion of power transmission and distribution network coupled with rise of commercial and residential sector would be the key drivers for the growth of the Cambodia switchgear market over the coming years. Currently, Cambodia Switchgear market is dominated by Air insulated switchgear in medium and high voltage category on account of advantages such as economical prices over gas insulated switchgears. Low voltage switchgears have acquired highest revenue share owing to increasing need for these in offices, residential buildings and retail sectors. Amongst all the regions, the Southern region captured the highest revenue share in 2017. However, the Western and other regions are anticipated to witness substantial growth in years to come due to government's rural electrification initiative which aims 100% electrification in rural areas by 2020. 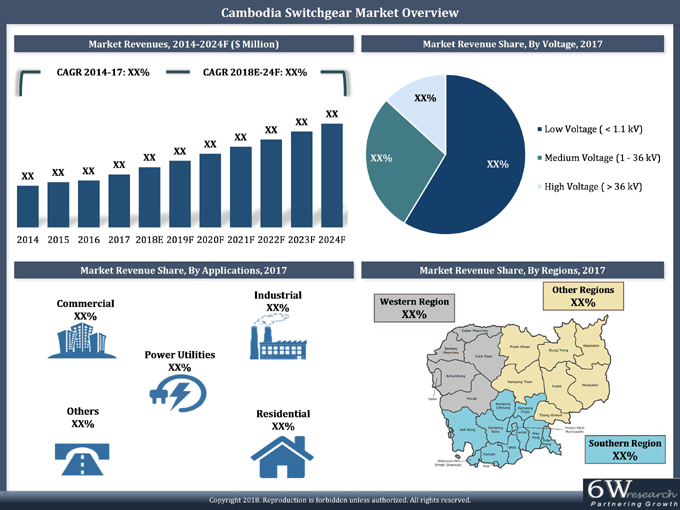 The report comprehensively covers the Cambodia Switchgear Market by voltage, insulation, types, applications and regions. The report provides an unbiased and detailed analysis of the on-going trends, opportunities/high growth areas and market drivers which would help the stakeholders to device and align their market strategies according to the current and future market dynamics.